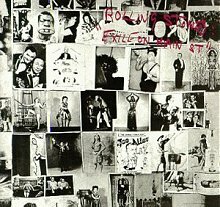 The Stones classic double album, Exile on Main St. was released in May 1972. their follow-up album Goats Head Soup, featured the hit “Angie”. Their next album was 1974′s It’s Only Rock ‘n’ Roll. Some Girls, which included the hit single “Miss You”, the country ballad “Far Away Eyes”, “Beast of Burden”, and “Shattered”. The band released their next albums Emotional Rescue and Tattoo You in 1980 which featured the single “Start Me Up”. in 1982 the Rolling Stones toured Europe to commemorate their 20th anniversary and released their next album Undercover in late 1983. In 1986′s the album Dirty Work was released,which contained the song “Harlem Shuffle”.The next album “Steel Wheels” included the singles “Mixed Emotions”, “Rock and a Hard Place”, “Almost Hear You Sigh” and “Continental Drift”. their next studio album 1994′s Voodoo Lounge,went double platinum in the US. and went on to win the 1995 Grammy Award for Best Rock Album.The Rolling Stones ended the 1990s with the album Bridges to Babylon which was released in 1997. In 2002, the band released Forty Licks, a greatest hits double album, to mark their forty years as a band. On 12th November 2012 The Rolling Stones released the album Grrrr to celebrate their 50th anniversary and have also made a documentary called Crossfire Hurricane. They also played Glastonbury Festival in 2013. Best known as the lead singer and lyricist of the rock band The Doors, TheAmerican musician, singer, and poet James Douglas “Jim” Morrison tragically died in Paris on July 3 1971 at the age of 27 after developing a severe alcohol and drug dependency although The exact cause of his death is sill disputed by many to this day and continues to be the subject of controversy and although A Heroin overdose seems likely no autopsy was performed on his body after death. Born December 8, 1943 Morrison studied Cinematography at UCLA before graduating in 1965 and forming The Doors with a fellow student Ray Manzarek. Thereafter, drummer John Densmore and guitarist Robby Krieger joined. The musicians, apart from Morrison, also shared a common interest in the Maharishi Mahesh Yogi’s meditation practices. The Doors took their name from the title of Aldous Huxley’s book The Doors of Perception (a reference to the “unlocking” of “doors of perception” through psychedelic drug use). Huxley’s own title was a quotation from William Blake’s The Marriage of Heaven and Hell, in which Blake wrote: “If the doors of perception were cleansed everything would appear to man as it is, infinite.”The Doors achieved national recognition after signing with Elektra Records in 1967. The single “Light My Fire” spent three weeks at number one on the Billboard Hot 100 chart in July/August 1967.Later, The Doors appeared on The Ed Sullivan Show, a popular Sunday night variety series that had introduced The Beatles and Elvis Presley to the United States. Ed Sullivan requested two songs from The Doors for the show, “People Are Strange”, and “Light My Fire”. Only a few of Kafka’s works were published during his lifetime: the story collections betrachtung (Contemplation) and Ein Landarzt (A Country Doctor), and individual stories (such as “Die Verwandlung”) in literary magazines. He prepared the story collection Ein Hungerkünstler (A Hunger Artist) for print, but it was not published until after his death. Kafka’s unfinished works, including his novels Der Process, Das Schloss and Amerika (also known as Der Verschollene, The Man Who Disappeared), were published posthumously, mostly by his friend Max Brod, who ignored Kafka’s wish to have the manuscripts destroyed. Albert Camus and Jean-Paul Sartre are among the writers influenced by Kafka’s work; the term Kafkaesque has entered the English language to describe surreal situations like those in his writing. Kafka sadly passed away on 3 June 1924 but his literature had a big impact on literature and film making. I Have recently watched the classic Doctor Who story Planet of the Spiders which follows on from the events of Invasion of the Dinosaurs, and sees Mike Yates discharged from UNIT and attending a Tibetan meditation centre in rural England. Sarah Jane Smith (Elizabeth Sladen) visits him and they witness some curious happenings at the centre, seemingly organised by a resident called Lupton, a middle aged former salesman, and his cronies. Mike and Sarah stumble across Lupton performing an incantation, which conjures up a giant spider which forms a psychic link with Lupton and tells him to find a certain blue crystal. Meanwhile The Third Doctor (Jon Pertwee) has acquired a mysterious blue crystal from the inhospitable planet of Metebelis Three, which is home to some enormous spiders, and is testing the psychic ability of a clairvoyant called Professor Clegg who unfortunately reacts adversely to the blue crystal. Sarah then returns from the retreat, having left Mike to watch things there. Sadly Lupton manages to steal the crystal from The Doctor and escapes back to the Meditation Centre, and then discovers that The huge spiders of Metabelis Three have sinister plans for Planet Earth and intend to conquer the planet and destroy mankind. However Tommy, the simple-minded handyman of the retreat, throws a spanner in-the-works when he takes the Blue Crystal from Lupton, and his mind is opened and improved by the power of the crystal. Lupton is teleported to Metebelis Three, subconsciously allowing Sarah to follow him, The planet is ruled by the Eight-Legs or giant spiders, and their Queen is the supreme ruler. They govern using guards chosen from among the planet’s Two-Leg (human) population and their own phenomenal mental powers, amplified by the blue stones of the planet. Then The Doctor arrives and he makes contact with a rebel named Arak, who explains that the Metebelians are the descendants of the crew of an earth space ship, which crashed hundreds of years before. A spider on board found its way to the Blue Mountains where, through the effect of the crystals, its progeny grew larger and larger and cleverer and cleverer. So the Doctor ventures to the Blue Mountains, where he encounters the Great One, a super-intelligent giant spider, wIth telelpathic abilities, who controls Metebelis and wants the blue crystal to give her power over other domains too. Back on Earth Tommy gives the crystal to the abbot, K’anpo Rimpoche, who is really an elderly Time Lord and the one-time hermit mentor of the Doctor who now lives in peaceful exile on Earth. After advice from K’anpo Rimposhe The Doctor returns to Metabelis three with the blue crystal and gives it to The Great One. Elsewhere On Metebelis Three, Lupton’s mendacity finally catches up with him and he is killed by the spiders. The Great One then uses the remaining Blue Crystal to complete a network of blue crystals which she hopes will magnify her mental powers and render her unstoppable, however it unleashes a deadly wave of Radiation which Kills all the spiders in the area and has unfortunate consequences for the Doctor…. 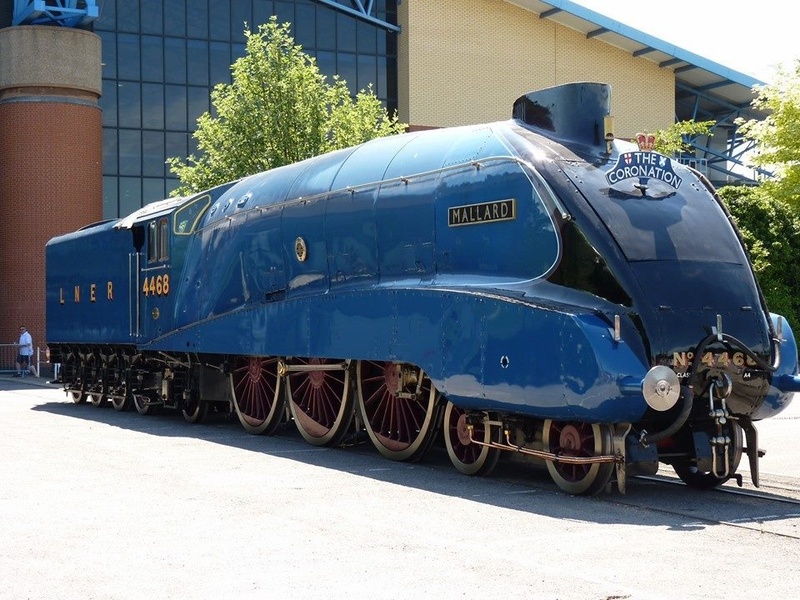 In 2013, To celebrate the 75th Anniversary of Mallard achieving the world record speed for a steam locomotive of 126mph in 1938, LNER 4468 Mallard was reunited with the only other surviving A4 locomotives for theGreat Gathering inside the Great Hall at the National Railway Museum, It was joined by the temporarily repatriated A4′s Dwight D Eisenhower and Dominion of Canada as well as A4′s No 60019 (LNER 4464) Bittern, 60007 (LNER 4498) Sir Nigel Gresley and 60009 Union of South Africa in the Great Hall at the National Railway Museum in York on 3 July 2013. Dwight D Eisenhower and Dominion of Canada eventually went home in Spring 2014 and Bittern, Sir Nigel Gresley and union of South Africa have since been busy doing various Rail Tours and Steam Galas. I remember seeing Union of South Africa, Bittern and Sir Nigel Gresley in steam down at the Severn Valley Railway. Best known for being a member of Depeche Mode, Yazoo, The Assembly, Erasure, and VCMG, the English singer-songwriter, musician, producer and Synthpop pioneer Vince Clarke was Born 3 July 1960. Clarke’s music career started in the-1970s, When he and schoolmate Andy Fletcher formed the short-lived band No Romance in China. In 1979, he teamed up with Marlow & Gore to form French Look. He then formed the band Composition of Sound, in 1980 with the addition of Martin Gore and Andy Fletcher. Clarke provided vocals until singer Dave Gahan joined the band, which was renamed Depeche Mode. At that time, he adopted the stage-name by which he is currently known: Vince Clarke. The band initially adopted a slick synthesised electro-pop sound, which produced the album Speak and Spell and the Clarke-penned singles “Dreaming of Me”, “New Life” and “Just Can’t Get Enough” in 1981. Vince Clarke teamed up with Andy Bell to form Erasure After placing an advert in Melody Maker for a singer, and they became one of the major selling acts in British music with international hits like “Oh L’amour”, “Sometimes”, “Chains of Love”, “A Little Respect”, “Chorus”, “Love to Hate You”, “Take a Chance on Me” and “Always”.Erasure have released 16 albums to date. In 2006 Erasure produced a country-western style acoustic album called Union Street, which consisting of mostly non-single cuts from their previous albums and contained the single”Boy”. In 2004, Clarke provided additional music for an episode of Johnny Bravo entitled “The Time of My Life”. Clarke was also involved in a project called Family Fantastic who released the album Nice! And released a second album, entitled Wonderful in 2009, Clarke was awarded by an “Outstanding Song Collection” prize, during the Ivor Novello Awards ceremony, in recognition of 30 years in the music industry and was also featured in the BBC Four documentary Synth Britannia. Later in 2012 Clarke collaborated with his former Depeche Mode colleague Martin Gore for the first time since 1981 as techno duo VCMG on an instrumental minimalist electronic dance album called Ssss, containing the songs Spock, Single Blip and Aftermaths and also collaborated with the band The Good Natured on a track called “Ghost Train”, and also produced a cover of the Depeche Mode song “Fly On The Windscreen” featuring Ane Brun.